EMB boring bars are “Eccentrical Mechanism Boring bars” which can adjust to required diameter via an eccentrical mechanism. The boring bar is not at the center of the holder, but offset from the center. • 99101: Adjustment range is +0.5 / -0.5mm. Each adjustment division is 0.03mm. • Ideal as small hole boring tool with excellent accuracy. • For fine boring operation on milling machines, machining centres and special purpose machines. • The indexable insert allows a variety of materials to be cut. • Ø5mm~Ø50mm boring bars are interchangeable. Balance grade: G6.3, 10000 r.p.m..
• Adjustment range is +0.12/-0.13mm. • Each adjustment division is 0.01mm. • Dimensions are easy to read. 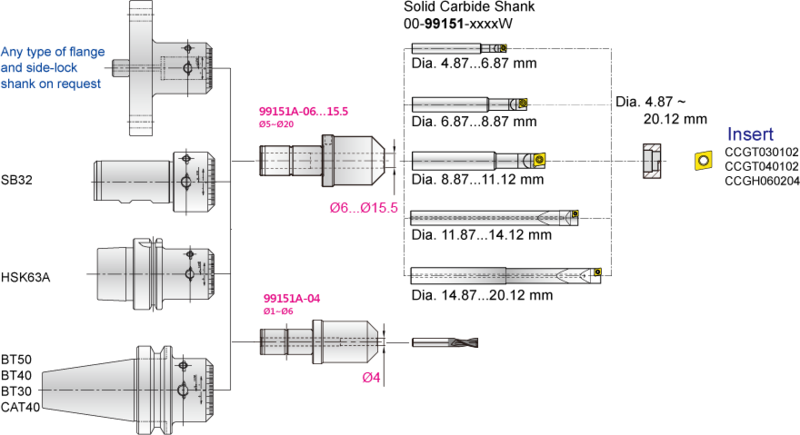 They are indicated on the tools and are easily adjustable on a tool presetter or in machining center. • Change the boring bar and set the boring dimension on the tool presetter in just one minute. ● Each division is 0.01mm, No back lash. • Adjustment range is +0.1/-0.1mm. • Good balance condition is maintained. • Apply for electronic parts and micro machining parts. • Ø14mm ~ Ø25mm boring bars. • Patented adjustment mechanism, to push insert directly by wedge and screw after clamped insert.